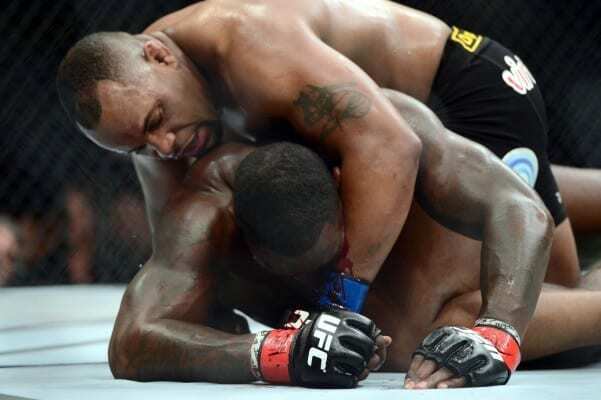 In dismantling formerly surging knockout artist Anthony ‘Rumble’ Johnson via second round submission in the main event of Saturday’s (May 23, 2015) UFC 187 from Las Vegas, Nevada, newly crowned light heavyweight champion Daniel Cormier put on his best-ever mixed martial arts (MMA) performance when it mattered most. It was a dominant showing that shook the monkey of falling just short in the biggest athletic competitions of his life off his back, yet it still left a large looming specter of doubt on Cormier’s reign as champion due to the absence of dominant former champion Jon Jones. As one of the best fighters to ever compete in MMA, Jones was obviously his own worst enemy when he was arrested on felony charges for his alleged involvement in an Albuquerque hit-and-run accident that left a 25-year-old pregnant woman with a fractured wrist and Jones with a whole lot of atoning to do after the UFC stripped him of the title and suspended him indefinitely. 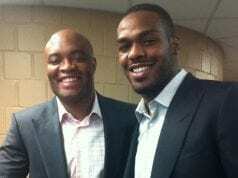 Jones famously beat Cormier in a grueling five-round battle at January’s UFC 182 after a trash talk-fueled buildup that lasted for months and months, and even though ‘DC’ called out ‘Bones’ aggressively after his pivotal win over ‘Rumble,’ there may not be much to suggest that he has much to offer the former top-ranked pound-for-pound fighter in a rematch. So with many fans crying out that Cormier’s belt is an ‘interim’ title, is he is the one and true best light heavyweight in the world? Cormier is undoubtedly the real champion. It’s not his fault that Jones decided to make some extremely poor decisions and put his future and career as one of the most popular athletes in the sport on the line for the sake of substance abuse. It could be argued that, with wins over a fading former champion in Dan Henderson and a late replacement in Patrick Cummins at light heavyweight, he didn’t really deserve his first title shot. 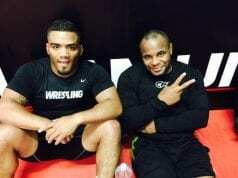 But in destroying ‘Rumble’ like he did on Saturday night, Cormier proved that definitely belonged at the absolute pinnacle of the 205-pound talent pool. He’s the one and true champion because Jones allegedly put his own selfish desires before his once-in-a-lifetime opportunity, and no one can blame ‘DC’ for taking full advantage of that opportunity. However, he may be the champ, but he’s just not the best. Jones is, whether we like it or not. He’s simply run through a long list of light heavyweight legends, and he’s also gone undefeated against the new breed of challengers he’s faced in recent years, including Cormier. ‘DC’ not only had Johnson in trouble, he absolutely wore him out before finishing him in the third round with his vaunted wrestling and smothering top control. Cormier never came close to controlling ‘Bones’ like that, and he certainly didn’t have him gassed out at any point. True, Jones has gone through some absolutely devastating personal circumstances recently, and he’s admitted that he needs to get his head right. Still only 27 years old, there’s no reason not to believe that Jones couldn’t return to the elite level he was fighting to for several years prior to his personal issues. It may take some time depending on what transpires in his legal proceedings, but Jones has confirmed that he’ll be back at some point to his teammates at Jackson’s MMA. That’s why Daniel Cormier is the champion, but he just isn’t the best.